"Loving God and loving our neighbors are the key to Heaven"
Brothers and sisters! I have a question for you. Right at this moment, are you close to the Heavenly Kingdom or are you far away from it? (Response: 'We are close to the Heavenly Kingdom!') We already know that the most important Commandment for us is that we should love God with our whole heart, with our whole soul, and with our whole mind and the second most important Commandment is to love our neighbors as ourselves. If we really impress these Commandments on our hearts and faithfully practice them, we should be close to the Heavenly Kingdom. Have you ever seen an airplane flying with only one wing on one side? . . . An airplane cannot fly with only one wing on one side; likewise, we cannot fly to the Heavenly Kingdom with only one wing. We need two wings to be able to reach Heaven. The first wing is our love for God and the second wing is our love for our neighbors. Many people say that they love God but do not love their neighbors. In that case, it will be very difficult for them to enter the Heavenly Kingdom. Then, who are our closest neighbors? To a wife, her husband is the closest neighbor. To a husband, his wife is the closest neighbor. The children, parents, and brothers and sisters are also the closest neighbors. Sadly, in recent years, love has been drying up and even being destroyed in many families. 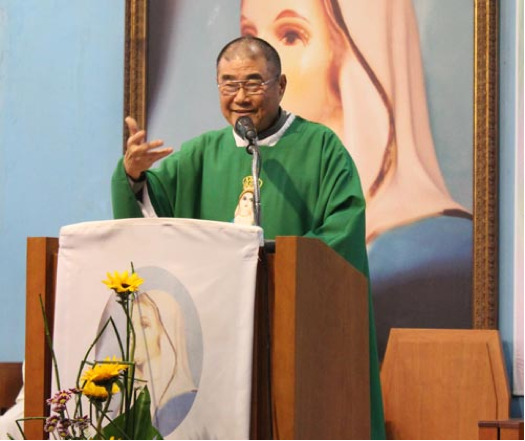 The Blessed Mother shed her first fears in Naju on June 30, 1985 and gave us her first message in Naju two and a half weeks later, on July 18. In that message, she said, " . . . A husband and a wife are joined together so that they may lead a happy life. But my Son Jesus becomes broken-hearted when they hate each other and do not forgive each other. You must love one another. Who are your closest neighbors? How can you say that you love me and love the Lord when you cannot even love those in your family? Sanctify your family through love and harmony. This is what my Son Jesus thirsts for." Who do you think are the main targets of the devil's attacks in our time? . . . They are the clergy and the families. Because so many people are not awake, their families are being disintegrating. There are some people who work hard in the church, but, when they go home, they become so different and mistreat their family. Brothers and sisters! We cannot enter the Heavenly Kingdom with only one wing. If we serve diligently in the church and worship God fervently but are unkind and unforgiving to our closest neighbors, one of our two wings is broken. As the devils are seeking all the possible ways to destroy the families, this is a very serious matter that love is disappearing in the family and the family is being broken apart. When families are broken apart, the number of priests and religious will also decrease and the Church will weaken. There was a couple with three daughters. Between the couple, many little things have accumulated over time and communication also gradually disappeared between them. Eventually they decided to divorce. The wife said to her eldest daughter aged 12 years: "Your father and I decided to divorce. You need to pick between me or your father." Her husband said the same words to his daughter. The eldest daughter went down to the basement at night, lit a candle, and prayed the rosary and did this night after night. Two younger sisters began looking for their elder sister, found her in the basement, praying and weeping, and joined her. Soon, their parents also knew this. Several days later, their father finally spoke to the eldest daughter, "I cannot do this divorce because of (three of) you." The girls continued praying in the basement. Before long, their parents reconciled with each other and the whole family began praying the rosary together. What you should do from today is to kneel and pray. A husband must pray for his wife. A wife must pray for her husband. If you only persist in being in discord and fight, the devil will be extremely pleased and say, "Right! You are not the one who is at fault. If you remain silent, you will be treated like a fool. Keep fighting! Fight more forcefully!" The devil will whisper to the husband, "Don't you remember the attractive woman you saw the other day?" and whisper to the wife, "Find a better man. You deserve a better man." I will tell you about another case. It happened in 1990. I was temporarily working at a different parish for two or three weeks. One day, a woman came to me with a face full of anger, "Father, I cannot eat anything because of my husband. I cannot sleep because of him. Please punish my husband severely." Her face filled with hatred looked very ugly. I asked her, "Do you love God?" She said, "Yes, I love God very, very much." So, I quoted to her some of the teachings in the Gospel and said, "If you love God, you must also love your husband, who is your closest neighbor." Then, I prayed with her, "Lord, let this daughter of Yours be able to forgive her husband from the depth of her heart." Immediately, she fell down on the floor by the power of the Holy Spirit. When she woke up, I asked her, "Do you still want me to punish your husband?" She answered, "No, Father. I just forgave my husband." She was smiling beautifully and looked at least five years younger. Because she opened her heart, Our Lord could remove all of her anger and resentment from her heart and filled it with joy, peace, and love. Brothers and sisters! Totally entrust everything to the Sacred Heart of Jesus and the Immaculate Heart of the Blessed Mother. Then, start praying with your family especially in this Year of Faith. Even when you feel that you must have a fight, offer it up graciously so that Jesus and the Blessed Mother may be able to come into your family and reside there. I know many people who pray together as a family. Some of their sons want to become priests and some of their daughters hope to become Sisters. Holy priests and holy religious come from holy families. 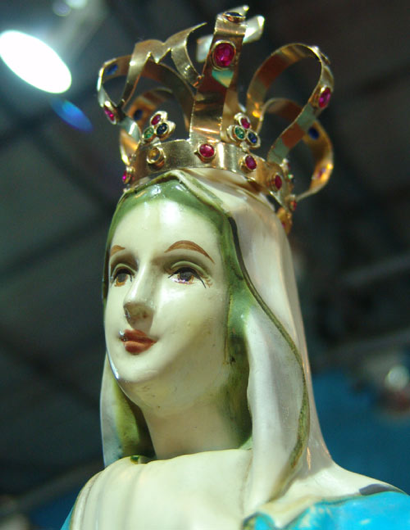 Lastly, I am going to tell you about St. Rita who lived in the 15th century Italy. Her mother was a devout Catholic and raised Rita to become filled with love for God and love for neighbors. Rita married a man, but later found out that he had killed a man. Rita began praying for her husband and tried to help him as much as possible. Rita found out that her husband had committed the murder because of a deep enmity between his family and another family. Later her husband was murdered by a member of the other family. Thanks to Rita's help, her husband was able to forgive the murderer before he died. Rita also publicly forgave the person who killed her husband. However, her husband's younger brother and her two sons were determined to take revenge on the murderer from the other family. Knowing this, Rita went to the person who had killed her husband and said to him, "My husband's relatives are coming this way to kill you. But how can I hate you, as God loves you? I already forgave you and wish to help you save your life. Without any delay run away with your son." Later, the father of the person who had killed Rita's husband came to her and thanked her for saving his son's life. Rita told him, "Now is the time for both families to be completely reconciled with each other and forgive each other." She further told him about the importance of their love for God and love for neighbors. Soon all in the two families gathered together and restored peace and harmony between them, which had seemed impossible before. Finally, I want to ask all of you the following questions. Will you really love God with your whole heart, with your whole soul, with your whole mind, and with your whole strength? (Response: "Yes, I will".) Will you really love your husband or wife, your closest neighbor, and your parents and children? (Response: "Yes, I will".) As you love God wholeheartedly and love your neighbors as your own selves, you should be able to fly toward Heaven with both wings. Now, the remaining homework for you is to go home and begin praying with your family every day. If you do this, you will be faithfully carrying out what the Holy Father is ardently asking every one of us to do in this Year of Faith. I pray for God's blessing on you.